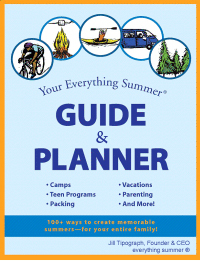 The first year I sent my children to camp, I began preparations several months in advance. I enthusiastically ordered the camp logo items, purchased horseback riding boots, and soccer cleats (for a child who hates soccer and thinks horses smell), and had labels ironed or sewn into every last sock. I also painstakingly typed a detailed list describing each and every item that I packed (e.g., green Nike t-shirt with black logo, tie dye rainbow tank with ice cream cones). Now, after more than ten years of packing two children for camp and various summer programs, I have a different approach. I peruse the packing list when it’s sent (typically several months before the actual trip), and make a note of anything that needs to be purchased (miner’s flashlight, hiking boots). Then, a few days before departure, clothing, accessories, toiletries, and supplies are taken out of closets and drawers and neatly piled in a staging area. Name stickers are affixed to everything, and into the luggage it goes. This may sound overly simplified, but it really doesn’t have to be more complicated than that. What I find is when parents are overwhelmed, it’s more a function of the emotional component than the actual difficulty packing. Mothers of first time campers and teens often call me for help. While they believe that the process is too much for them, what they are having a hard time with is the reality of their child leaving home. Somehow, having the perfectly organized trunk with perfectly labeled clothing and gear comes to represent how loved the child is. My advice to packers is to separate emotion from the physical task on hand. When the focus is on packing alone, the job gets done more easily. In addition, here are some tips for summer packing with minimal hassle. •	Forget ironing or sewing on labels. Arm yourself with a Sharpie laundry marking pen or stickers (purchased online) that affix to the label of any item of clothing. These can also be used to label toiletries and personal items. •	Go light on the toiletries. For camp packing, remember that there’s a fully stocked infirmary with band aids, Neosporin, ibuprofen, or anything else your child might need (as most camps ban parents sending anything medical). For teens, pack the basics, but there’s no need to have multiples. •	Purchase extra new socks and underpants. When you’re purchasing the 18 pairs of socks and underpants required, buy an extra dozen of each. Have these in your child’s drawer for when s/he returns from camp or travel. Whatever makes it home after the summer will be ripe for the trash bin. •	Use plastic travel bags to contain clothing. Contain small items in these bags, so they stay together in the duffle or luggage. Pack socks in one, bathing suits in another, t-shirts in another. This will also make unpacking easier for your child. Do not over pack. You may think your child/teen needs three different tops to choose from daily, or your teen will not get to launder clothes often, so you want to pack ‘just in case;’ but please do not. And camps/programs are not responsible for lost items, so sending the best is a mistake. Plus, teens are responsible for lugging their luggage, so do a test first to see if they can carry what you want to pack. Keep camp/summer specific items separate. Camp towels, linens, clothing with the camp logo, “bunk junk” (small games, flashlights, canteens) should not be integrated into the linen closet, utility area, or playroom. Keep it separate, so when packing next year, you’ll have it all in one place. No need to pack worn out, dirty shoes when returning home. Tell your child not to bring home any sneakers or shoes except for the ones on his/her feet. Also discourage him/her from bringing home any clothing that’s stained, ripped, or beyond repair. Schedule the lice check. When your child gets off the camp bus or the plane, take him/her for a lice check before s/he enters the house.